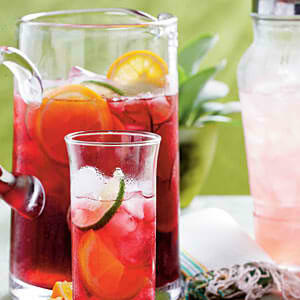 June is National Iced Tea Month! To help you celebrate, we’re giving you recipes for our favorite iced teas- perfect for serving poolside all summer long! This classic is easy to make and loved by just about everybody south of the Mason Dixon line. Bring water to the boil in a saucepan. Add tea bags and simmer for two minutes. Remove from heat and cover. Let stand for ten more minutes while the tea steeps. Remove the tea bags and add sugar, stirring until it’s dissolved. Allow to cool before pouring over a glass full of ice. Garnish with fresh mint or a lemon. 1. Bring 3 cups water and cloves to a boil over medium heat; reduce heat, and simmer 10 minutes. Remove from heat, and add tea bag; steep 10 minutes. 2. Discard tea bag and cloves. Add fruit juices and sugar, stirring until sugar dissolves. Chill and serve over crushed ice. Garnish, if desired. 1. Bring 4 cups water to a boil in a 2-qt. saucepan. Remove from heat, and add tea bags. Cover and steep 10 minutes. Discard tea bags. Stir in sugar until dissolved; add orange and lime slices. Cover and chill 2 to 6 hours. Stir in ginger ale, and serve over ice. 2. Note: We tested with Celestial Seasonings Red Zinger Herbal Tea. Not too sweet and not too bitter, this tropical twist on traditional sweet tea uses fresh lime juice for a refreshing treat on a hot summer day. Found on Allrecipes.com. Pour the water into a gallon sized jar over the tea bags. Allow to steep for 45 minutes. Remove and discard the tea bags. Stir in the sugar and lime juice until the sugar has dissolved. Cool to room temperature; refrigerate until cold before serving.